This one’s for all you fishermen and fisherwomen out there in search of the best travel fishing rod. I’m not a pro, but I really enjoy fishing in my spare time. And I have to say, one of my absolute favorite things to do is pack a fishing rod with me when I travel. I have been to so many great fishing destinations in my time. From Miami to fishing in Dubai. I have been so fortunate to be able to do this in my spare time! I would definitely recommend fishing to anyone! Don’t feel like reading? 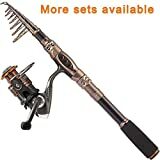 I wholeheartedly recommend the Plusinno Carbon Telescopic Fishing Rod. It seems like some of the best fishing I’ve ever done has been far from home. I’m not complaining, either – there’s always something gratifying about catching a fish somewhere new. My friend checked out some competitive Cruise deals by chance and then had the opportunity to fish in so many different destinations, all in one vacation. After struggling to pack up my bulky, normal rod every time I traveled, I decided it was time to find the best travel fishing rod to take along for future trips. I’ve never known much about fishing rod models, but researching and testing all of these travel rods has given me a new appreciation for how important it is to buy the right rod for whatever kind of fishing you want to do. I’ll go through some background info below, but you can use the table of contents if you’re looking for a quick answer! What makes a great travel fishing rod? Just like any travel accessory, there are a few key qualities you want to look for when choosing which fishing rod to bring along on your travels. You want your travel rod to be small and light. It doesn’t matter if it’s collapsible, modular, telescopic, or anything else, as long as it’s small and light. When you’re on the road or in the air, you don’t want to lug around your heavy-duty fishing rig. There’s a time and place for sturdy, one-piece rods, but it’s not while traveling. If you insist on bringing your long, heavy fishing rod with you on a bus, on a plane, or in a car, all you’re going to do piss everyone off. For travel fishing rods, small and light are the top characteristics you want to look for. Quality is hard to judge when it comes to travel rods. I mean, let’s face it: stuff breaks when you travel. It’s inevitable, no matter how careful you are. This means you probably don’t want to carry around a top of the line rod with you at all times. You’ll just end up worrying about it, and worrying while fishing should be a crime. At the same time, you want something you can depend on. There’s nothing more frustrating than finding yourself out on a boat or standing down at a dock with a broken fishing rod in your hands after one single cast. So with travel rods, it’s important to find one that’s good enough to get the job done, but that you’d also be ok with losing if worst comes to worst. How did I test these rods? I began these tests with 25 different travel rods. Surprisingly, I quickly whittled that 25 down to 4, due mainly to poor craftsmanship. Anything that broke the first use was instantly thrown out. I tested each of the four rods mentioned in this article thoroughly and rigorously. Each travel rod was subject to the same circumstances and the same number of casts. I took all four with me on a cross-country trip from PA to Colorado, and rotated casts until each one had been cast out 40 times in one session. I’m very pleased to announce up front that none of them broke on me during the trial run. I’ll keep this review updated as time goes on to note any future breaks, but all four travel rods are in great shape at the time of writing this.  It's the best gift to send father, son, husband，fiance, boyfriend. Warm Prompt: Full Kit without carrier case: 1 Fishing Rod + 1 Fishing Reel + Fishing Line + Various Fishing Lures + Fishing Hooks + Some Necessary Accessories.  Perfect elasticity, high density Carbon fiber mixed with fiberglass makes your fishing pole hard & durable.  Stainless Steel Hooded Reel Seat is anti-seawater corrosion; EVA Fore Grip for comfort. The telescopic fishing rod is portable, and closed length design is convenient carrying around. Power: Medium; Extended Handle. For me, the best travel rod is the Plusinno Carbon Telescopic Fishing Rod. Plusinno really just covered all of their bases with this collapsible rod. The rod comes in six different sizes, and you can decide whether or not you want just the rod and reel, or if you want Plusinno’s entire fishing rod kit. Even the longest option is only a foot and a half long when fully collapsed and closed – more than small enough to easily fit in just about anywhere. You’re not going to do much better than that as far as travel fishing rods go. Quick note: The language on the Amazon listing is a little confusing – you do not get two rods when you order this. It’s one single rod, and the “2 count” they mention is 1 rod + 1 reel. 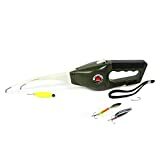 The fishing rod kit includes: 1 rod, 1 reel, 6 fishing lures, 6 fishing hooks, 4 fishing weights, and an assortment of other accessories like leads and so on. If you opt for the kit you literally don’t need to buy anything else. You grab the kit and you’re good to go right out of the box. This is perfect for me because I’m lazy, but it’s also great because you can keep your main tackle box in-tact at home instead of cannibalizing it every time you go traveling. The pole itself is definitely up to snuff. It’s made out of a high density carbon fiber mixed with fiberglass, and you can just feel how durable it is. They say you can use the rod as a freshwater rod or as a saltwater rod, but I’d be a little wary of using it for ocean-fishing beyond the shore. It’s a sturdy rod, but it’s just not big enough or balanced enough for true deep sea fishing. If you find yourself casting into saltwater, though, don’t worry – everything is resistant to saltwater corrosion. The reel holder that attaches the reel to the rod does seem a little flimsy to me if I’m being honest. However, I haven’t actually had any problems with it so far. You might want to keep an eye on it though. If you’re just looking for a rod that works, you can skip this section. If you’re a fishing rod nerd like I’m turning into, read on! The Plusinno utilizes a 5.2:1 gear ratio, which means that the reel speed is fairly slow. 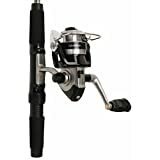 That’s not a bad thing, though – this gear ratio is very standard among all-purpose poles, and will serve you well no matter what type of fishing you get into. This travel rod is rated at a line capacity of 0.20mm/240M, 0.25mm/200M, and 0.30mm/140M. If you’re not sure what those numbers mean: The first number is the diameter of the line in millimeters, and the second number being the length of the line that will fit on the reel at that given diameter. I honestly don’t have any complaints that I can think of. Plusinno really did makes the best travel fishing rod I’ve had the pleasure of using. There are certain travel rods that will be more portable, more suited to certain styles of fishing, etc., but if you’re just looking for a solid, one-size-fits-all travel rod, you cannot go wrong with this Plusinno product. If you’re a fishing expert that really knows your rods, you won’t be particularly impressed by this one. But, like I said, it really fits the part of beater, travel rod perfectly. It’s sturdy enough that I expect it to last for years to come, but at the same time I wouldn’t be too upset if I break or lose it while traveling. At this price range, I’d just buy another one! The Pocket Fisherman Spin Casting Outfit rod, by Ronco, is hands down one of the coolest gadgets I’ve played with in recent memory. When it’s all folded up, it looks more like a tape dispenser than anything else. And when I say this thing is portable, I mean this thing is portable. It’s only 9 inches long, 3 inches wide, and weighs 12.8 ounces. This thing is literally less than a foot long when it’s folded up, and it weighs less than a pound. I don’t think it’s physically possible to create a travel fishing rod smaller, lighter and more compact than the Pocket Fisherman rod is. When you snap the “rod” part of it out and lock it into place, the little rod almost doubles in length – it’s right around 18 inches long when in use. Some of you are probably rolling your eyes right about now, because it really does look like a toy for kids. Funnily enough I would definitely recommend this awesome little rod for any child fishing enthusiasts, but it’s an absolute must have for anyone who likes to fish on the go. I personally have one of these in my glove box at all times. You never know when you’ll be able to get a few casts in, right? Even better, this little guy comes with 2 free lures that you can actually store inside the hollow handle of the rod. There’s enough room in there for a third if you really jam them in, and I keep one of my own favorites in there next to the free ones. If you’re not sold on this cool little travel rod already, it does have an anti-reverse lock on the handle too. You can even clip it right on to your belt if you get tired of holding it and want to close your eyes for a bit after casting. You won’t be catching any marlin with this rod, but it’s unbeatable for a relaxed day of casting into a pond, river, creek, etc. Like I said before, it really is the perfect gift for kids that are getting into fishing, although I guarantee you’ll be loath to give it up after you’ve played around with it yourself. If you’re a true fisherman, the Pocket Fisherman Spin Casting Outfit is an absolute must. You seriously won’t regret giving it a try. This cool little composite travel rod kit by Daiwa is perfect for those who prefer modular rods, but are really tight on space. The rod itself splits into 5 pieces, and is only 4.5 feet long when fully constructed. It breaks down to fit inside a hard-shell case that measures 14 inches long, 7.8 inches wide, and 2.5 inches thick, and the entire kit weights right around a pound. The case has built-in tackle compartments that are just big enough for a few lures, extra weights/hooks, or whatever else you might need on a fishing trip. This Daiwa rod kit is perfect for keeping under a car seat, train seat, etc while on the road. The 4.5 foot rod length is a bit short for me, but I always prefer taller rods for their increased casting potential. It definitely does save on space, which makes this kit a prime candidate for camping trips as well. You honestly won’t even notice you’re carrying it with the rest of your stuff – that’s how light it is. Now to be perfectly honest, I’m not a big fan of composite rods. I think they tend to wear down faster than other types of rods, and once the modular pieces don’t fit snugly anymore you pretty much have to throw the rod out. I can be an overly-emphatic caster when the situation calls for it, and I’ve sent my fair share of composite rod pieces flying into the water. That being said, I’m very happy with how well the Daiwa has held up since I bought it. The case is really are a nice touch, too. It might technically be bigger than “just” a single rod, but it’s hard to decide exactly where to stow a naked rod without a case. Modular travel rods will never be my first choice but the Daiwa is a fantastic option for those of you who do prefer composite rods. For those who prefer a spinning rod approach to fishing while traveling, the Okuma VS-605-20 Voyager Spinning Travel Kit is a great choice. As soon as you get wherever you’re going, you can assemble the sturdy rod in minutes and get casting right away. The reel itself is a 20-size spinning model that features a ball-bearing drive and aluminum spool, and is perfect for trout, panfish, bass, catfish and walleye fishing, among others. I really think this is one of the best reels out there, as far as travel rods go. It’s great for long distance casting with floaters or weights, and even lends itself nicely to spur-of-the-moment fly fishing if you find yourself without your normal fly fishing rod. The whole setup is stored in an awesome padded case that has a foam insert with spaces cut out for each component of the rod itself – everything fits perfectly. The rod is 6 feet long when fully constructed, but breaks down to fit perfectly into the case that measures 17 inches long x 9 inches wide x 3 inches thick. When you break the rod down and store the rod and reel inside the case, the whole thing is remarkably compact. It fits perfectly underneath a car, bus, or train seat, and wouldn’t take up that much room in checked luggage at all. Okuma has all of their bases covered, too: the rod boasts comfortable cork grips on the rod handle, and stainless steel detailing that’s also resistant to corrosion. The kit comes with a small tackle box that holds the perfect amount of gear for a lightweight fishing trip. Like I said at the beginning, I’m no fishing expert. I love it as a hobby, and I like to think I’m pretty well-versed in the basics. But, I’ll never be spending hundreds of dollars on a top-of-the-line fishing rig. For those of you that do, I respect your dedication immensely and completely understand if you disagree with my opinion on what makes the best travel rod. For the rest of you, you cannot go wrong with one of these four rods. If you’re just looking to blow off some steam while traveling, take your pick and start casting!